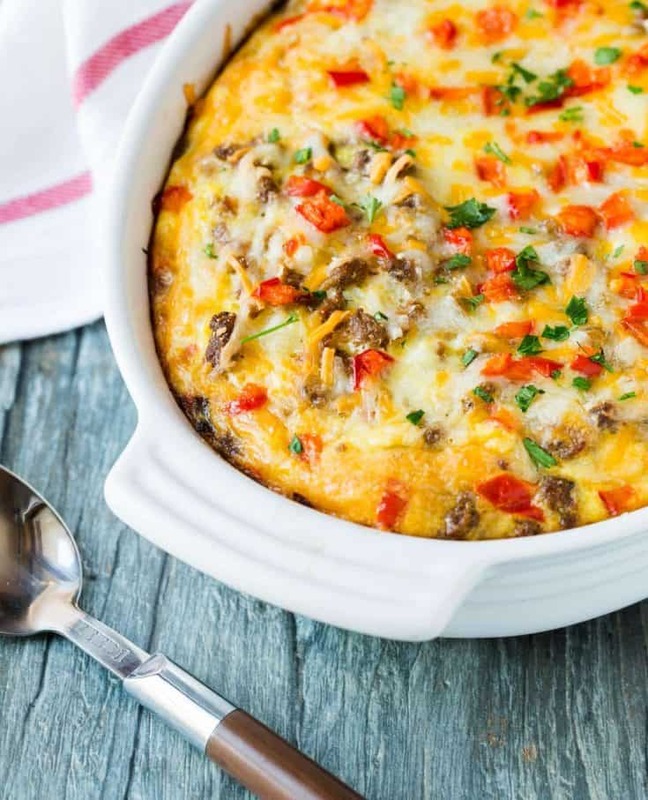 Need an easy breakfast for a crowd? 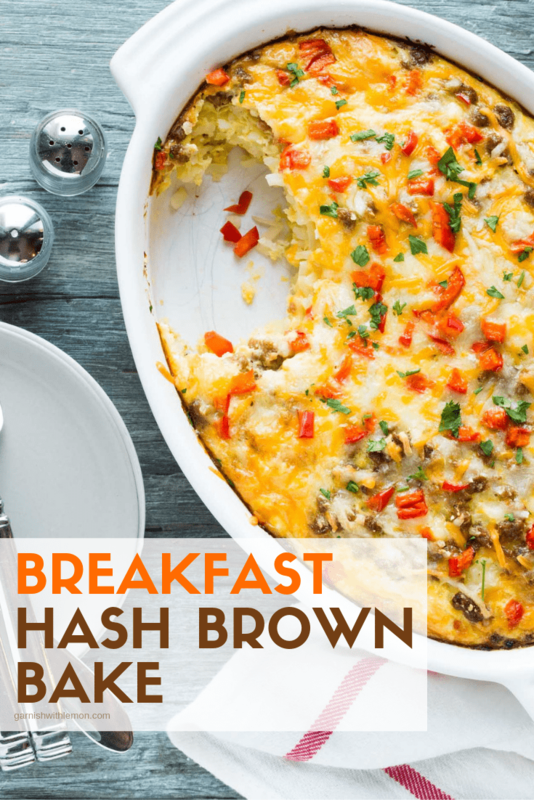 This naturally gluten-free Breakfast Hash Brown Bake comes together in minutes and will be ready to eat 30 minutes later. I don’t know about you, but the last thing I want to do after enjoying a cocktail (or two!) and a big meal with friends is to start prepping breakfast for the next day. Don’t get me wrong, I love a great egg bake, but sometimes I don’t want to have to think about breakfast until the next morning. And that my friends is where this Breakfast Hash Brown Bake comes into play. Simple, easy to throw together and on the table within an hour. If that doesn’t make hosting a brunch easy, I’m not sure what does. Another reason I love this breakfast dish? Its versatility. Whether you add ham, sausage or bacon, it’s all delicious in this dish. And if you are feeling really crazy, add more than one. This hash brown bake is the perfect time to use up all of those leftover bags of shredded cheese that mysteriously accumulate in the fridge. A little bit of swiss, a little bit of cheddar, a little bit of gouda – it’s all good here. Sometimes I’ll get really adventurous and add some pepper jack. Life on the edge, people. Have you gotten the idea that this is uber foolproof? 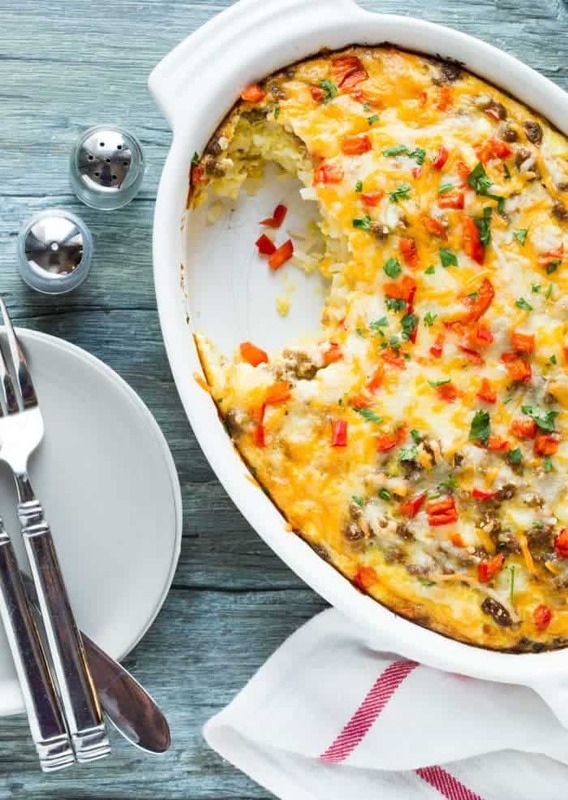 Whatever you decide to fill your breakfast bake with, it’s going to be delicious for your hungry guests. Pull some muffins from the freezer, mix a simple fruit salad, pour some mimosas and call it good. Actually it’s more than good. It’s a mouthwatering brunch that was easy to pull together. But don’t worry, your secret is safe with me. Time Saving Tip: Have you tried Jimmy Dean’s Sausage Crumbles? It’s pre-cooked sausage ready to go. That means less prep time and fewer dishes! LOVE! Looking for more Brunch Ideas? Follow us on Pinterest! This naturally gluten free brunch dish comes together in no time! Warm butter and oil in a medium skillet. Add hash browns and onion and cook over medium high heat for 5-7 minutes or until lightly browned. Remove from heat and set aside. Crack eggs into a medium bowl and whisk. Add milk and whisk thoroughly to combine. Add mustard, salt, and pepper and whisk. Add cheese and red pepper and stir to coat. Pour potato and onion mixture into a greased 9 x 13 pan and top with meat. Pour egg mixture over top and bake at 350 for 30 minutes or until lightly browned around edges and cheese is melted.